Let’s start with a little back story. Simon Transport Services was created over 25 years ago as business venture of Wendy and Paul Simon. Starting with an offer to buy one truck, the business began from a small office in their family home. Wendy stayed at home and looked after the office based side (and the children), While Paul was out working hard on the road. With a lot of hard work, determination and a wealth of connections, the business began to grow. After not too long the company soon began to outgrow the small confines of the home office, so it moved to where we are located today at Thorney business park. With a Yard large enough to house our fleet of vehicles, and our office space. Timing couldn’t have been better. The move felt right as the business park used to be home to Bison Concrete, a Company we had worked for, for many years. Let’s jump to a decade ago when the business started a major expansion into plant and access. With a large investment into new equipment our Low Loader division began. We were lucky to be able to offer some great drivers a new position within in the company. And both son’s Gregory and Ashley who hold their class one licences, were out on the road. In recent years we have majorly invested in an updated fleet, our vehicles had a major overhaul bringing them up to date with the latest technology available. 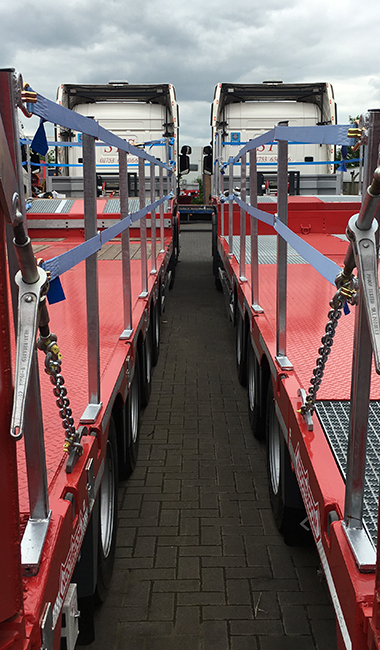 Only last year we updated our plant and access trailers buying 6 new Nooteboom Trailers with specifications purposefully tailored to the work we do. Simon Transport Services Is an extremely family orientated business. All three Simon children growing up around transport industry and the family business, have followed in their parents footsteps. The oldest Son Gregory Simon is now the Managing Director of business running the day to day operation. Ashley Simon is the Fleet Manager, who is out on the road most days. And the youngest Lisa Simon is the Office Administrator. Most of our drivers have been with us for a long while and we like to show our appreciation with family events, like our annual family bonfire night celebration and staff Christmas Parties.